Starwood Preferred Guest (SPG) sent out emails yesterday trying to get more members to use their app based key solution. Eligible members can earn 500 bonus Starpoints for each stay (up to 3) where they use the app to check in and access their room or suite. 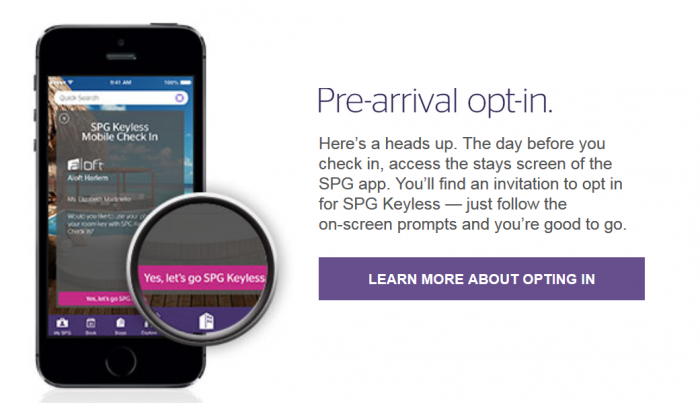 You can access SPG Keyless here. Note that this offer is only available for those that received the email. I am eagerly awaiting for the first SPG Keyless & Bluetooth hack that would allow third party to access the guest room without consent (will eventually happen). Those that received the offer and are staying at any of the hotels that are part of the Keyless initiative, this could be an easy 1,500 bonus points (if they can get the Keyless to work). Bonus offer: You can earn 500 Starpoints for up to three SPG Keyless stays, for a maximum of 1,500 Starpoints. Earn 500 bonus Starpoints® for each eligible stay up to three stays. Member can earn 500 bonus Starpoints after one (1) eligible paid stay, 500 bonus Starpoints after the second (2nd) eligible paid stay and 500 bonus Starpoints after the third (3rd) eligible paid stay. As part of this promotion, member may earn a maximum of 1,500 total bonus Starpoints for three stays from July 16, 2015, through October 1, 2015 (the “promotion period”). This promotion is not transferable. Bookings made prior to the promotion period are eligible, but only eligible stays consumed during the promotion period will earn a bonus. An eligible stay is a stay with at least 1 eligible paid night at any of the participating SPG Keyless hotels and resorts during the promotion period. Bonus Starpoints will be credited to the member’s account within 2–4 weeks of the stay posting to the member’s Starwood Preferred Guest account following the first, second and third eligible stays.